Furthermore rightmove states: "Momentum spreads north and west with six out of ten regions setting record price highs this month"
This is inline with my conclusions of 4 months ago as illustrated by the following 2 pieces of analysis on regional and London house prices. Though of course rightmove is commenting on ASKING prices, which is not the same as what houses actually SELL for. The most recent Halifax average house prices (NSA) data for February 2016 is £206,320 which is a far cry from Rightmove's headlines grabbing £303k that stands at an over £90k difference between average house prices and asking prices. In fact the gap between asking prices and sold prices is now at its highest ever this century! Which is indicative of a housing market in a state pf paralysis as a consequence of the lack of supply vs huge demand pressure given the huge gap between what buyers are willing to pay / can afford, and what home owners fantasise about their homes being worth. And there is no sign to the end of this paralysis because the Bank of England imposed rules in 2014 to reduce the risks of another mortgage lending led banking sector collapse so as to prevent future Northern Rocks or RBS, or Halifax, well virtually where every bank stood in 2008. Which means the amount lenders can lend over 4.5X earnings is limited to 15% which means as house prices rise the Banks are forced to reduce the number of high multiple loans they are able to offer so as to stick to the 15% limit. 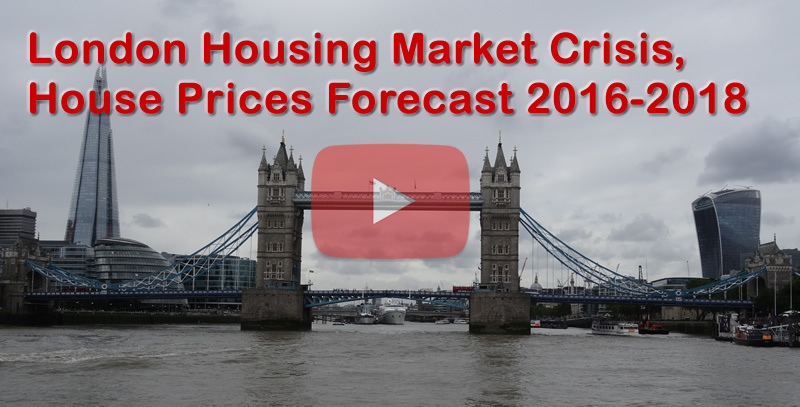 UK average house prices (£206,320) are currently showing a 5% deviation against the forecast trend trajectory, which if it continued to persist then in terms of the long-term trend forecast for a 55% rise in average UK house prices by the end of 2018 would translate into a 13% reduction in the forecast outcome to approx a 42% rise by the end of 2018.